Aquileia was founded by the Romans as a military colony in 181 BC He was first bulwark against the invasion of the Barbarians and the departure point for expeditions and military conquests. Thanks to a good road network and an impressive river port, over time it became increasingly important for its business and for the development of a highly refined crafts (glass, amber, fictilia, gems …). Reached its zenith under the rule Caesar Augustus (27 BC – 14 AD), becoming the capital of X Regio “Venetia et Histria” and speeding up the process that would have made this one of the most important cities of the Roman Empire. Durations following centuries, internal wars, raids or reprisals external and rapid incursions threatened the city, which is involved in the wider crisis of the Empire, slowly began to acquire a new face becoming, with the arrival of Christianity, the center of missionary outreach and of ecclesiastical organization. The charm of Aquileia did not leave you indifferent?! .. Do you want to get to know the extraordinary evidence that preserves, especially in the majestic PATRIARCHAL BASILICA (rich in valuable works of the fourth century onwards, including the oldest and largest floor mosaic of the Christian world and the Byzantine frescoes, commissioned by Patriarch Voldorico II in the crypt)? 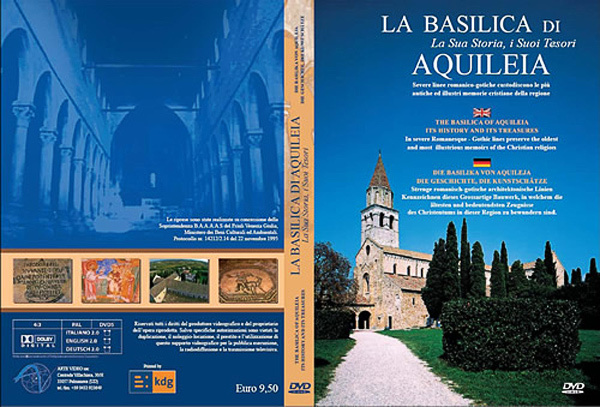 It’s available for sale a 42-minute DVD video full of images and graphic reconstructions that tells the story of the architectural basilica that followed for over a millennium, turning the first church teodoriana in the current basilica.